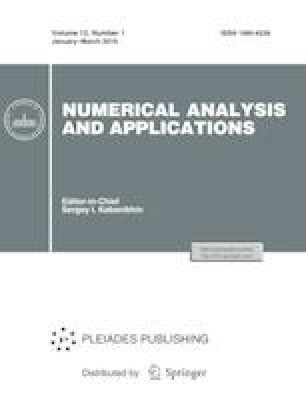 Algorithms for solving an inverse source problem for production–destruction systems of nonlinear ordinary differential equations with measurement data in the form of time series are presented. A sensitivity operator and its discrete analogue are constructed on the basis of adjoint equations. This operator relates perturbations of the sought-for parameters of the model to those of the measured values. The operator generates a family of quasi-linear operator equations linking the required unknown parameters and the data of the inverse problem. A Newton–Kantorovich method with right-hand side r-pseudo-inverse matrices is used to solve the equations. The algorithm is applied to solving an inverse source problem for an atmospheric pollution transformation model. Russian Text © A.V. Penenko, 2019, published in Sibirskii Zhurnal Vychislitel’noi Matematiki, 2019, Vol. 22, No. 1, pp. 57–77.